NABJ JSHOP students, Jessica James (foreground) and Jaleah Green (top) working in their newsroom in downtown Detroit, MI. Photo by Skyler Glover. Eleven high school students are learning how to be journalists this week at the National Association of Black Journalists Convention. The students, who are from Detroit, Los Angeles and Houston, are participating in JSHOP, an interactive workshop to teach journalism fundamentals. Since 2009, the program has provided mentorship from professional journalists, educators and journalism college students through lectures, presentations and hands-on training. 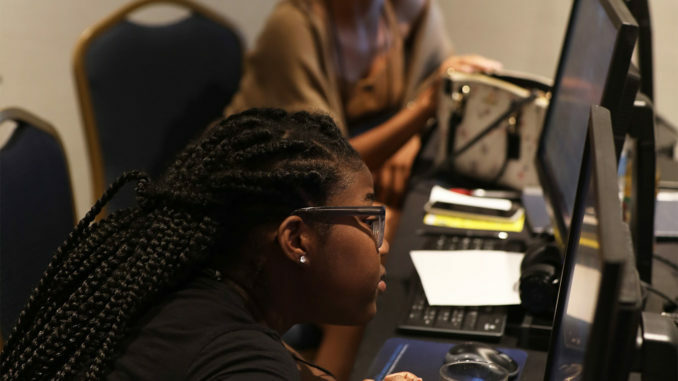 By the end of the workshop, students will have enhanced their newsgathering, writing, photography, video production, radio, graphic design, editing and social media skills, according to the NABJ website. “We consider ourselves an important pipeline to training and inspiring the next generation of journalists,” said JSHOP Director Sheryl Kennedy Haydel. The application process is a competitive, Haydel said, but the goal is to reach students in the host city of NABJ’s annual convention. From 9 a.m. to 5:30 p.m. each day, students work on story ideas, interviewing and writing. Haydel said mentors set high expectations for the students because they know the students can handle it. Sophomore Clare Jones of Mercy High School in Farmington Hills, Michigan, said JSHOP is a way to improve her writing and an opportunity for networking and exposure. Jones also finds the conference humbling and exciting. “Mostly in this area, there aren’t a lot of programs that help students with their writing sources and overall English in general except if you’re in school or have a tutor,” Jones said. As part of the workshop, students wrote profiles on each other and Jones did a profile on Eva Coleman, this year convention’s chairwoman. Josh Hawkins, a rising sophomore at Seven Lakes High School in Houston, Texas, applied for JSHOP to learn more about the journalism business. Charlotte Bachelor, who graduated from Lakeview High School in Saint Clair Shores, Michigan, and will be attending Michigan State University in the fall, saw JSHOP as a great way to bridge her high school journalism experience to college.